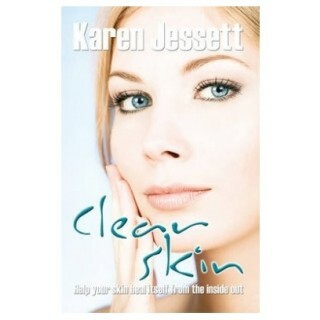 Clear Skin: help your skin heal itself from the inside out by Karen Jessett. This book provides information on everything you need to achieve clear skin: foods to help prevent acne; foods to avoid; probiotics and prebiotics; the acid/alkaline balance; easy acne treatments; useful supplements; relaxation techniques; the importance of sleep; exercise advice; personal testimonials and many useful resources. Also includes over eighty delicious clear skin recipes. The skin is the largest organ of the body and helps your liver, kidneys, intestines and lungs eliminate waste products. Your skin is a reflection of your internal health. You really can get rid of acne, naturally. How? By learning about the causes of acne and how to rebalance the body. By understanding that applying harsh chemicals to the skin can actually exacerbate the skin’s natural oil production and make acne worse. "I bought your book and I am truly thankful to you and the research you did to cure acne from the inside out. I have been following your diet for four weeks now and my skin has improved so much." "This plan is excellent! I’ve been following it for a few weeks now and already seen a great improvement in my skin, weight, and general health." "A must for anyone who has acne...I would recommend the book to anyone who wants to live a life free of acne and other skin blemishes." "Sure to clean you enough on the inside to make you sparkle on the outside...I wholeheartedly recommend this book." Why the need to detox? to anyone who has severe acne or even the occasional blemish. It's simply amazing how great this wealth of knowledge is! I am more than pleased with my purchase and it was certainly worth the few dollars I spent for invaluable information. Thank you again for such a wonderful product! I am really enjoying the book! I am trying a lot of the recipes (because I have also recently become a vegetarian) and I love them, they are bringing a lot of new flavors into my kitchen. I especially like the stiry fry with cashews and I am adding variations with coconut milk. The book also got me back into my routine of facials and masks and I am trying the dry brushing. It all works and its a great book! So, thank you! 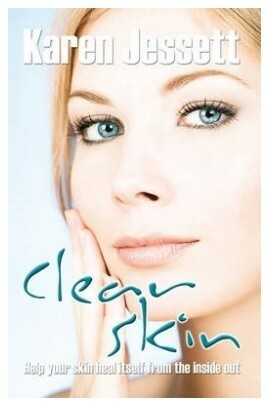 The Clear Skin book is GREAT! I absolutely love how easy it is to read and how many alternatives are offered. The book is straight to the point and offers sound and practical advice on making acne a thing of the past! Thanks for writing such an amazing book! I bought your book and I am truly thankful to you and the research you did to cure acne from the inside out. I have been following your diet for four weeks now and my skin has improved so much. It was so hard to make my hubby understand that I had to change my eating habits, but he is finally supporting me on everything. My skin looks much better than it used to. THANK YOU! Hi. I just got your book today. Thank you. Wow, you must have went through alot of reserach. I am already on raw food diet because of my skin disorder: acne. Yeah, I have noticed that oil has done good to my skin complexion. I find your supplements and daily care chapters very beneficial for me. That's something that I need to know. I have already made a list of products that I would like to get. Just a quick note to say that already after having your book for just over a week, I have seen a vast improvement to my skin — I'm 26 and suffered from acne since I was 12 -- I'm hoping that finally I've found something that works. The bookcame in today and I was able to read through it this afternoon. I wanted to personally thank you for the information you've compiled into this guide. After years of antibiotic use and the side effects, I thought I was not repairable. I'm 24 and can't believe what horrible things I've learned about my antibiotic usage and Accutane rounds have done to my body. Three weeks ago, your book and site inspired me to stop the antibiotics and look further into some of the other things going wrong in my body. I've learned so much about probiotics and natural healing. I started the probiotics two weeks ago and now I'm able to incorporate your information and hopefully heal my skin and the rest of my body. Again, thank you so much for the book. As of tomorrow I'll be milk and dairy free! Maybe I'll email you in 4 months to let you know how all is going. I'm enjoying the diet. It's not too different or hard to follow. I loved going to The Body Shop; I'd never gone in there before now. My skin responded really well to the steam and Blue Corn mask treatment. Thank you very much for your suggestions and leadership with this new lifestyle. This book offered advice and options easily understood by my 12 year-old daughter. 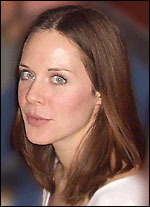 She has found the guidelines easy to abide by and has experienced a notable improvement in the clarity of her skin. Thank you! What I liked about the book was that it was easy reading. Everything was concise and in plain language. I found it very beneficial especially the juice recipes. This plan is excellent! I have been following it for a few weeks now and already I have seen great improvement in my skin, weight, and general health! Most skin care advice seems counter-intuitive, especially when you are told to use harsh cleansers and take scary internal meds that interfere with normal hormonal processes. The Clear Skin plan feels right and really works! Best thing is the information about skin saver, sinner and detox plan. I have used some of the information and it gives me good result. It made me think before I ate the wrong foods for my skin. I was able to change my diet easily which led to clearer skin and a more confident and outgoing everyday life. Chop the carrots and apples into small enough pieces to fit your juicer. 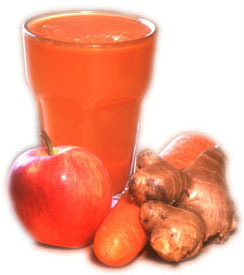 Put the chunks of carrot and apple through your juicer, and then juice the ginger. Pour into glasses carefully making sure the froth stays behind. Presented in easy-to-digest sections, the book starts off with an explanation on who this book can help. Acne is described and there is some information on antibiotics (against-life) and probiotics (for-life). Towards the end, the importance of water and supplements are discussed. In the body of the book, we are given easy reference charts on foods which are good for your skin ("Skin savers") and foods which are bad ("Skin sinners"). Then the book proceeds to describe the advantages and practicalities of various cleanses, such as fasting, juicing and detoxing. The relevance of nutrients regarding general well-being are discussed. Next, we have the recipes, and it was at this point I became riveted! Karen Jessett's immense creative ability definitely followed her into the kitchen! The ingredients in the smoothies are bound to make anyone's skin glow: oranges, papayas, blueberries, raspberries and blackberries are just a few of the fruits used to help the body in its quest for becoming acne-free. As a total salad addict, I was already sold on the following section before I looked at it! Avocado, mango and pine nut salad, Green herby salad and Thai salad all hit the spot (really, no pun intended)! By this point, you may be so excited about the recipes that you've forgotten why you're on this plan! Good; let that happen, sit back, relax and enjoy the next twenty-eight days. Easy-to-make, nutritious soups are followed by main courses; including Japanese spring rolls, Tofu goreng and Gado Gado with steamed vegetables. One thing's for sure, you won't be bored or hungry while on this plan. In fact, it could just be the blossoming of a beautiful romance between you and fresh, wholesome food! When writing recipe books, people always save the best until last -- and in this case, Karen really did because the desserts are to live for! I'll have Banana and cardamom ice cream pie with a side of Mango and strawberry pie to go, please! And finally, dips and snacks offer us hummous and guacamole to scoop, spread or dip as our fancy takes us. Once you have feasted your eyes on all the recipes, Karen then offers a four week menu plan, using the recipes in this book. This means that when you are doing your Clear Skin plan, you don't have to think about it! You can just do it. Not forgetting that people have a social life, Karen gives suggestions for dinner party menus, too. Exercise, relaxation and mediation are all covered. They are an important part of healing any problems in the body, but Karen makes specific reference to activities that will target your skin. Daily care is an interesting section, because the way you treat your skin whilst on the plan and then afterwards will make a difference. Karen's top ten tips are another easy-reference section which will help you develop excellent daily habits for the sake of your skin. Before the very useful contacts and resources comes a diary of a young lady who used the Clear Skin plan. We follow her over 28 days, and see in real life just how effective this plan really is. This is a highly inspiring part of the book, as we can learn so much from other people's experiences. It was such a pleasure to read this book, because the advice within it could be used to lighten anyone's life, acne or no acne! Of course, if you have acne or spots, the plan is sure to clean you enough on the inside to make you sparkle on the outside. However, if you don't have a skin condition, then the plan will still be instrumental in increasing your health and well-being. I wholeheartedly recommend this book to anyone interested in how to look and feel their best. Karen is one of a growing breed of women using natural health and her inner wisdom to keep herself in top shape, both inside and out. As I have the great pleasure of knowing her personally, I can vouch for the changes in her skin while she tested out, experimented with and then followed her own skin plan. However, the changes weren't only skin deep. Because this book works on a holistic level, her energy levels also increased, and everything in her life became lighter. For the ultimate in clear, beautiful skin, invest in some E3Live and the Clear Skin Inneralk CD.